Dark Escape is a horror themed two-player light-gun game, reminiscent of Sega’s House of the Dead series, whereby you shoot-up a horde of monsters through a selection of themed levels. Unlike most light-gun games which simply present the player with a screen and standing light-gun, Dark Escape comes with its own booth for players to sit in which is jam packed with an assortment of hardware aimed at both immersing players (e.g. 3D, vibrating seats, surround sound) and sharing their experience with others (e.g. outside TV monitors). 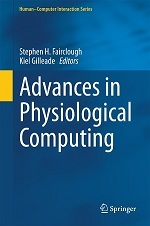 The games unique gameplay mechanic is a biofeedback element called the “Panic Sensor”. 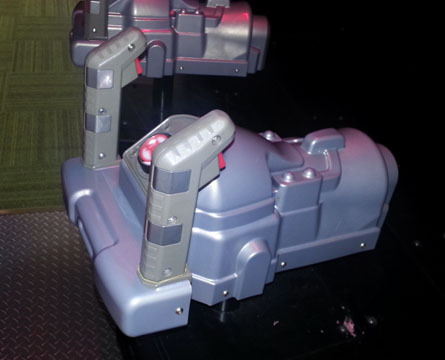 During play the game monitors the player’s heart through electrode contacts built into the light-gun controller and displays their current heartbeat rate in the top-corner of the game screen. The game uses the player’s heartbeat rate to evaluate their physiological response to scary gameplay events e.g. when a monster jumps out. 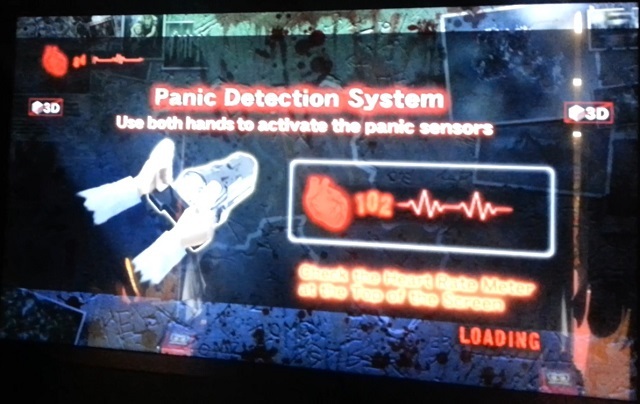 When a scary event occurs the player’s heartbeat data is masked by the game while it assesses the effect on the player’s physiology. After a set period of time the game indicates whether the player was scared (“Panicked”) or not (“Safe”) and then restores the heartbeat rate display. At the end of each level, which I sadly didn’t reach so I had to look this up*, the game displays the number of times the player was panicked by the game. In a one-player game this feedback doesn’t really add much to the experience but in a two-player game the panic score adds a new competitive element to play i.e. who was scared the least? From my experience of the game, scary events where all shock scares e.g. surprise zombie attacks, and while not original for a horror game, are likely to be effective for the biofeedback mechanic they’ve chosen. Especially given the effort the developers have put into immersing the player through the various supported game outputs. I played several games of Dark Escape, both on my own and with a friend. As a one player experience the feedback from the panic sensor doesn’t really work for me as the mechanic is purely passive, both of the player (self-regulation is not expected of the player) and the gameplay (heart rate doesn’t effect the gameplay). For a more active biofeedback mechanic the game would of needed to train the player to self-regulate their physiological responses which obviously was not the case here. Instead the developers focused on interesting visualisations of the player’s physiological data which could be shared during play and this is why the game worked better for me as a two player experience. Seeing how both you and friend respond to scary events is kind of fun, and its worth a laugh knowing your friend was easier to scare than yourself. While the game mechanic was fun for a couple of go’s, I did feel the panic visualisation was rather muted during play i.e. player’s need to keep an eye on it as its located in a screen corner. Its only during the stats overview at the end of a level where your physiological responses are really shown off. If the developers are interested in pursuing this form of mechanic they really need to go big and have the player’s physiology have a larger effect on the games interface using all the available outputs e.g. 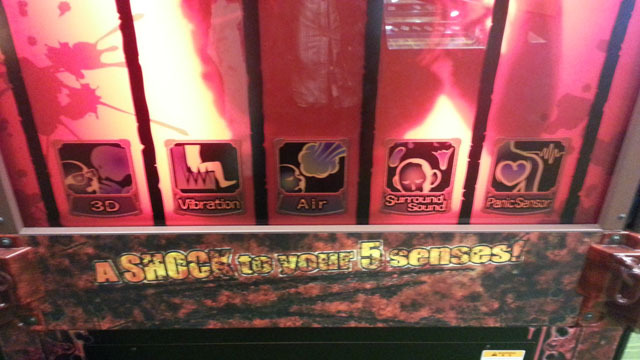 vibrating the seat to your heart beat (or your friends), in order to really ramp up the horror element. Hopefully they can put this all together in sequel in time for my next holiday. 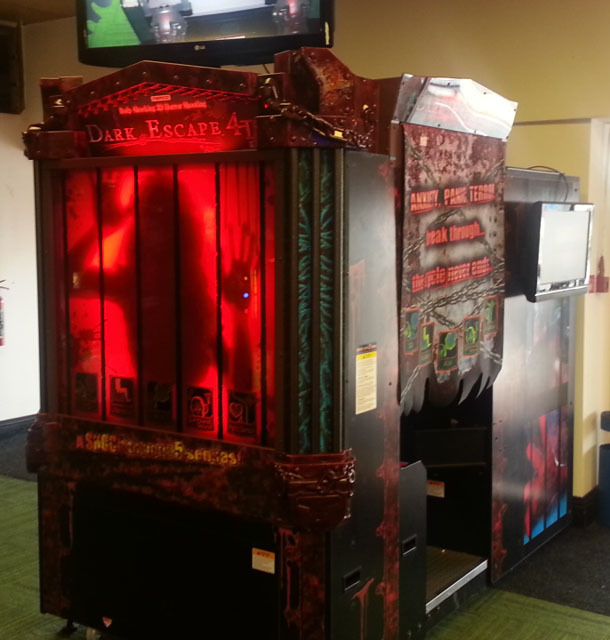 If your interested in trying out Dark Escape for yourself, you can find the one I played at Mr T’s amusement arcade at Blackpool. * The game didn’t really sell me at all on what the biofeedback element added to the gameplay. Originally I thought the panic sensor was being used to control the gameplay however after multiple games this didn’t seem to be the case.